All text, photographs and models by, and copyright of, Aldo Zana. Reprinted with permission of VeloceToday.com on-line magazine. Italian counterpart, Aldo Zana tells us all about these British models. 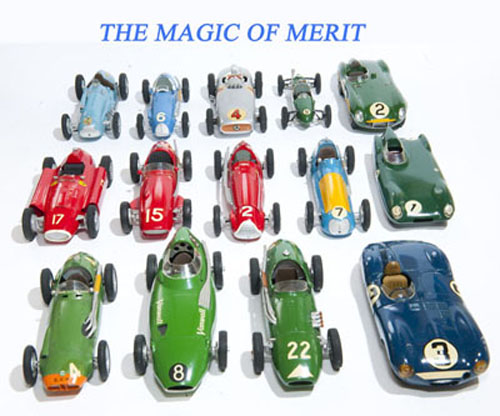 The whole range of the Merit 1:24-scale plastic kits assembled and painted in period liveries: mid-Fifties. Front line: British F1 and the Jaguar D-Type. Mid row: Italian F1 and Grand Prix racers and the Lotus 11. Rear row: French racers, Mercedes W196, Cooper 500 MkIX and Aston Martin DB3S. 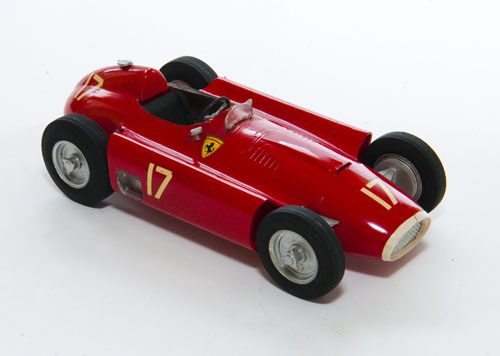 It was hard times in the second half of the Fifties for European kids in love with Formula One and longing to become part of its world by collecting and playing with model racers. We Italians faced especially limited choices: the hard-to-find die-cast Nigam, the elusive Zax, or the old Mercury racers of the Forties: oddly scaled, with questionable faithfulness and tires fit for an all-terrain army truck. The rise of globalisation brought from the UK to the best Italian toy shops the die-cast Dinky Toys and the first Corgi Toys. 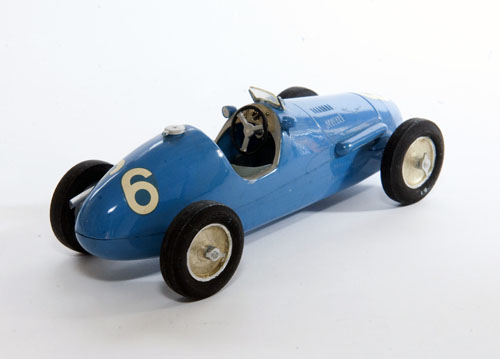 The former listed obsolete F1/F2 single seaters of the early Fifties in its catalogue. Corgi featured more updated models of British production: however, merely two, already non-competitive in real life against our all-conquering Ferraris and Maseratis after Mercedes-Benz’ withdrawal in 1955. And they looked too small alongside the Dinkies and Mercuries. And then, out of the blue, cameMerit, although quite difficult to locate among the contemporary fast-growing and highly visible offerings of plastic (polystyrene) kits dominated by the leading US brands of Monogram, Revell, and Aurora. Italian racers of the Forties and Fifties. 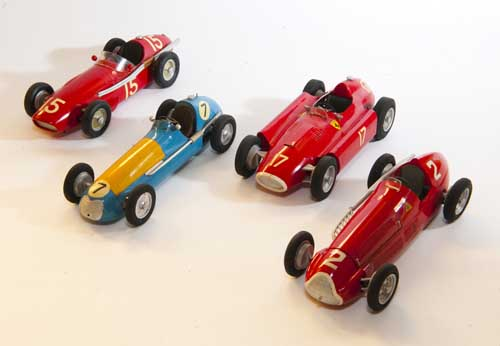 From the left: Maserati 250F, Maserati 4CLT/48, Lancia Ferrari, Alfa Romeo 158. 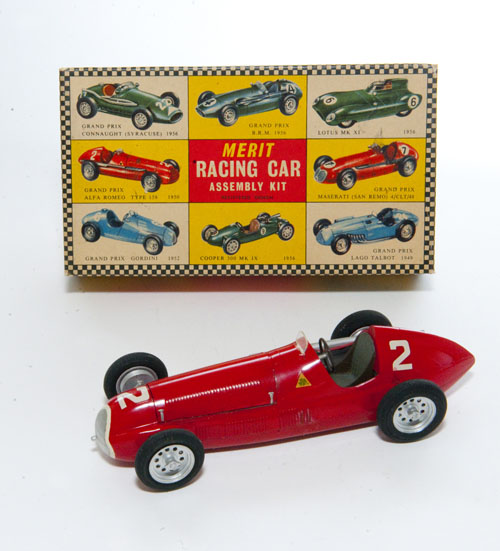 In 1957 Merit produced precise 1:24 scale models of current Formula One protagonists: Lancia-Ferrari V8, Maserati 250F, Gordini T-16, as well as milestones of the pre-1952 F1 seasons: Alfa Romeo 158, Talbot-Lago T26, Maserati 4CLT/48 “San Remo”. 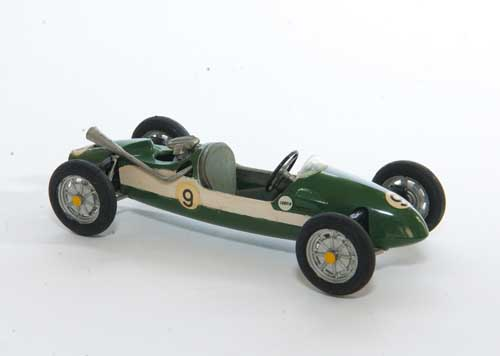 And thanks to a flurry of new offers in a few months’ span, we could also buy and build the emerging British single-seaters striving for the limelight after a decade of playing second fiddle to the Italians in the form of the Connaught B-Type “Syracuse” 1956, BRM P25 1956, and the Vanwall VW4 1956. Jaguar D-Type, the lesser known Aston Martin DB3S and the as yet unknown Lotus Mk XI, a name on the verge of becoming a leader. All British: the three sports cars in the series. 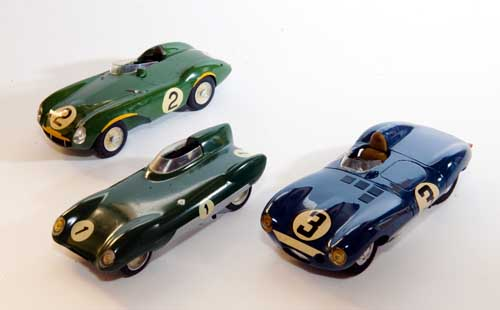 From the left: Aston Martin DB3S, Lotus 11, and Jaguar D in Ecurie Ecosse livery. The Merit kits came from a company called J & L Randall Ltd., based in the town of Potters Bar, Hertfordshire, north of London. They were all sold in a standard, nondescript box, the same for every model: small and unappealing at a time when competing US brands already showcased their products on box-lids with colourful and attractive art to win the prime spots in shop windows . The only way to select the right Merit kit was a small label glued on one of the narrower sides. The Alfa Romeo 158 with the standard box in the background. The box was the same for every kit. the average monthly salary of a worker was about 45,000 Liras. 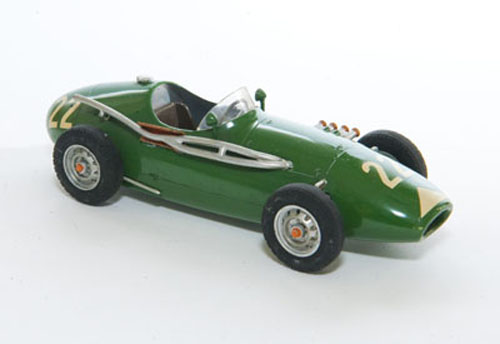 By comparison, a Mercury die-cast model racer cost 180 Liras and a Dinky 230-250 Liras. The kits were moulded in flawless plastic; the surface was so clean and regular that it was possible to skip painting the body. It wasn’t a simple task for a kid to smoothly hand brush the Humbrol enamels; airbrushes for modellers were still a long way into the future. The solvent used at that time by Humbrol allowed, nevertheless, a clean and uniform finish even when working with the brush. 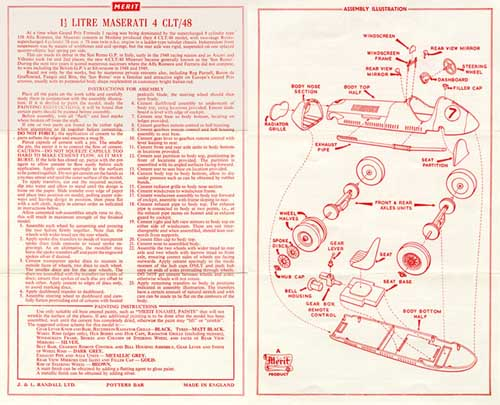 The instruction sheet of the 4CLT/48 Maserati. The front side tells in short the history and the races of the real car, the back side presents a clear illustration of the easy assembly procedure. Assembly was quite straightforward too: the body was split in two halves, top and bottom. Axles and driver seat had to be glued to the bottom half, other details (exhaust pipes, windscreen, dashboard, steering wheel) to the top section, before joining these two sub-assemblies. Each wheel/tire was moulded in two halves and the tire had to be carefully painted matte black. The spokes were a decal (transfer, in British parlance) to be applied on a little transparent celluloid disc, subsequently set onto the outside of the wheel prior to gluing the hub cap. The quality of the decals was only fair and I preferred to avoid them. cracking. Yet, it was possible to soften them using highly diluted vinyl glue, given the lack of softening liquids on the market. The instruction sheet had a pedantic list of building steps on the front, ending with the painting scheme, but a clear assembly drawing on the back. More interesting was, at the top of the first page, a short presentation of the real car, a summary of its main successes as well as a basic description of its technical characteristics and performance. 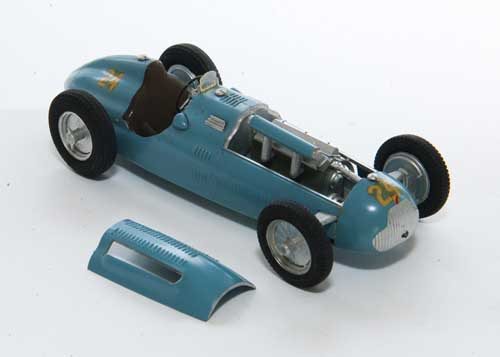 Talbot-Lago T26, 1949, one of the two “super” kits featuring engine detail. The body was left unpainted. Note the smoothness of the plastic injection. 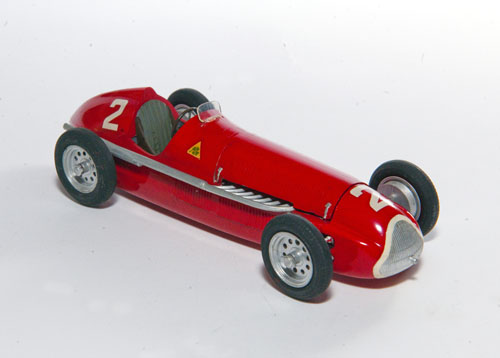 Two kits were super-detailed to include the engine and a removable engine bay cover: the 1950 Alfa Romeo 158 and the 1949 Talbot-Lago T-26 4.5 litre. Both were probably made so detailed because the moulds were already available when pressure to launch new models forced the company to simplify and shorten the production cycle. BRM P25, Connaught B-Type “Syracuse”, Gordini T16, Vanwall VW4. A very British choice was the addition of the Cooper 500 Mk IX, 1956. 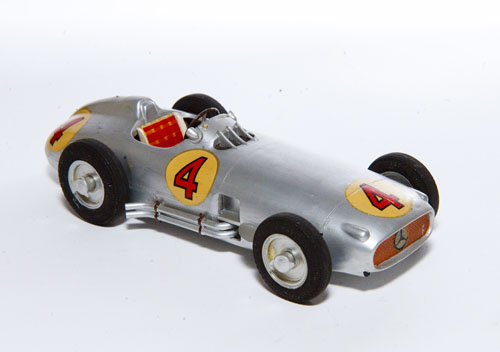 A tribute to the former German dominance was the kit of the Mercedes-Benz W196, the 1954 road-racing version mistakenly presented as the 1955 model. 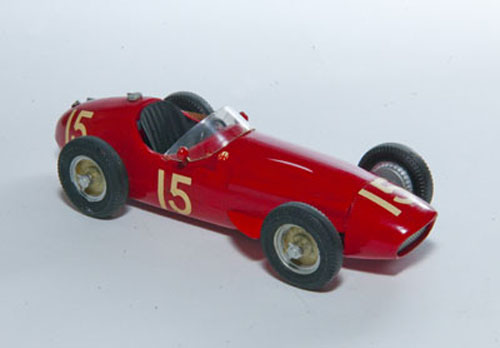 The Maserati 4CLT/48 was another obsolete racer in the series. 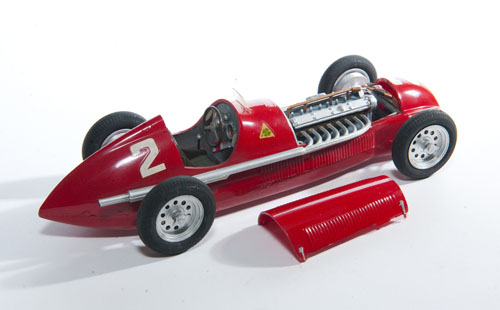 The kit didn’t have the inner details of the Alfa Romeo and the Talbot-Lago. It was an unusual selection of a car that wasn’t a winner, yet it was well-known being driven by Thailand’s Prince Bira and Brit Reg Parnell. A real piece of history outside F1 and sports cars, the Cooper 500 Mk IX, 1956, recalls a glorious period of British racing. Body unpainted. A final touch of class was the colour of the ink used for the instruction sheets: dark red for the Italians, British Racing Green for the British, blue for the French. The Mercedes sheet fell outside the paradigm, printed in dark blue as the historically correct white or silver would have been impossible to read. 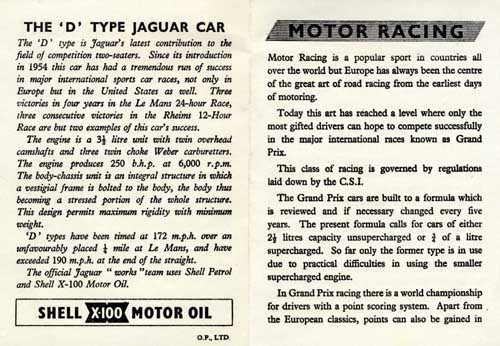 educational leaflet on Motor Racing, a more detailed description of the prototype, and a promotional bottom line advertising the brand of motor oil used in races by the car. 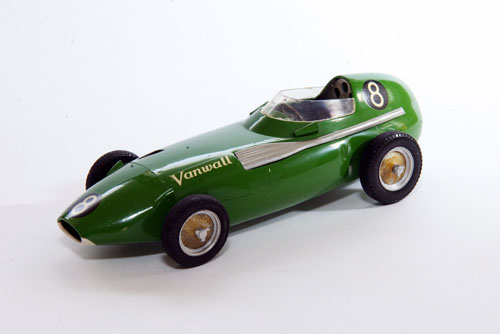 The leaflet on the Vanwall doubled to eight pages and ended with a tribute to Tony Vanderwell who “raised the prestige of British Automobile Engineering throughout the world”. 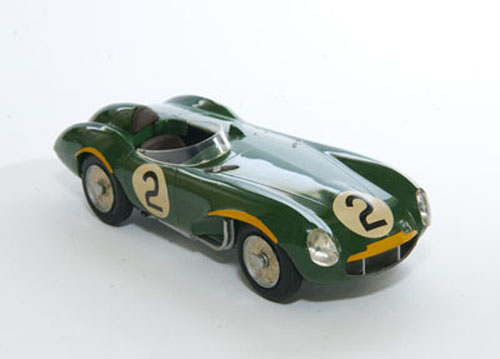 The four-page leaflet in the Jaguar D-Type box. A good recap of the car’s history. Britain still ruled. And the following year it also became true in F1. Below, all fourteen of the Merit models in individual photos. You won’t see this often! 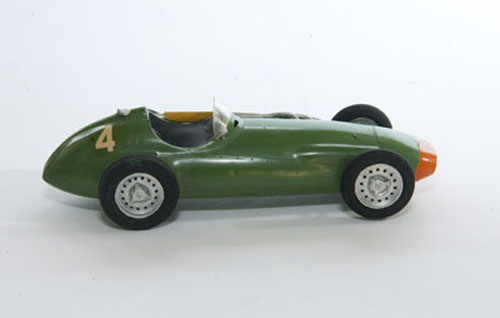 Vanwall VW4, 1956, when the Brits knocked at the forefront of F1. Decals are original. 1956 Lancia Ferrari. The Merit kits was on sale early 1957, a remarkably short time-to-market. 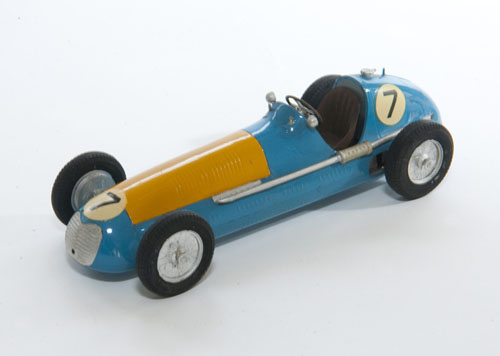 Gordini six-cylinder F2, 1952. Humbrol paint (“Enamel” on the original British tin) to cover the body. Alfa Romeo 158, 1950, hood in place. Talbot-Lago T26, 1949. A good representation of the engine. The diminutive Cooper Mk IX, 1956. The silver exhaust was easier to paint. 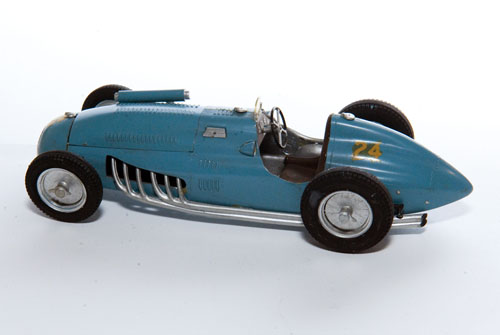 Maserati 4CLT/48 in Argentinian livery, as raced by Fangio in Europe. Aston Martin DB3S, 1956. The yellow trim is an addition of the kit builder. Connaught B-Type “Syracuse”, 1956. Quite a rare bird in real and scale model worlds. 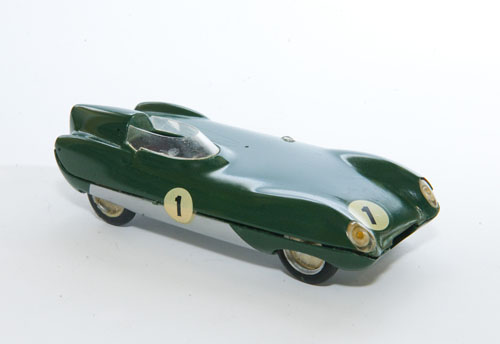 Lotus 11, 1956. Airbrush repainted after 60 years when the plastic suffered signs of shrinking. 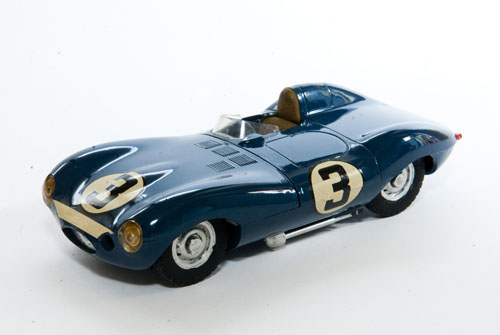 Jaguar D-Type, 1954. The gap at the rear end of the front section of the body is due to having modified the part to make it tilting forward like the real thing. BRM P25, 1956. To use the brush for the semi-metallic finish was quite a brave endeavour over- sixty years ago.